AIMA conducted May MAT 2017 exam in paper based mode on 7th May 2017 in a single session across the country. The candidates who took the exam felt Data Analysis & Sufficiency tricky in comparison to the other sections. MAT exam was conducted smoothly from 10:00AM to 12:30 PM. MAT exam had 200 MCQs that were divided into 5 sections (Language Comprehension, Mathematical Skills, Data Analysis & Sufficiency, Intelligence & Critical Reasoning, and Indian & Global Environment). The candidates were allotted a time limit of 150 minutes. All the questions were in MCQ format followed by 4 answer options. 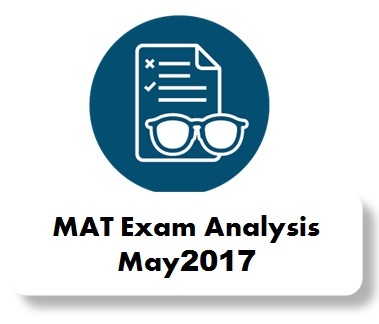 Let us take a look at the sectional analysis of MAT May 2017 exam. In all, there were 18 questions from arithmetic and the level of difficulty was moderate. So aspirants can expect a higher percentile in this section. Moving forward with Intelligence and critical reasoning section, test-takers mentioned that questions in this section were from topics such as calendar, distribution, assertions reasons, blood relations, analogies, direction, series, statements. Various topics carried questions in sets. The overall rating for the level of difficulty of the questions from this section remains ‘moderate’. The fifth section also comprised of 40 MCQ based questions. The questions were based on conventional GK, business and economics, current affairs. It should also be noted that performance of the students in this section will not be counted for calculation of percentile. Ideally a student should have spent not more than 30 seconds to pick the correct choice. As per the opinion of the experts, exam-takers scoring around 330 in 4 sections out of 800 marks can expect to score 99+ percentile. We advise that those who will appear in Computer based MAT 2017 on May 13 should further revise for the exam and make their weak areas stronger. You can revise from previous year MAT Exam question papers and gain a better understanding of MAT exam pattern. Subscribe with us to receive more updates on MBA Exams and latest news about the top MBA institutes and colleges!